Ex-Ikos chair Coward launches illegal hedge fund. | "I've got a new invention. It's a revolving bowl for tired goldfish." Ex-Ikos chair Coward launches illegal hedge fund. Martin Coward, co-founder of Ikos Financial and estranged husband of Elena Ambrosiadou, is preparing to launch his own hedge fund. The FT reports the fund will be activated next year, using the same state of the art proprietary technology to benefit from high frequency trading that has lead to Ikos’s success. Although Coward is the original code designer he does not have ownership of it. Ms. Elena Ambrosiadou has put in place an injunction that is enforceable in the EU (UK & Cyprus) making it illegal for Mr. Coward from talking about Ikos or to any individual connected to the fund, ever. 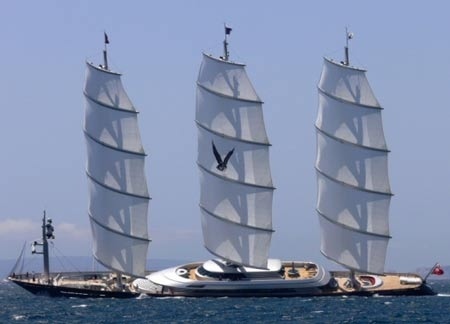 The Maltese Falcon built by Perini Navi is a clipper sailing luxury yacht, owned by Elena Ambrosiadou.